Nearly every American house I've lived in has long ago been demolished to make room for some other building. There is a delicious (though painful) paradox here: Americans long for stability, but all they get is stationary impermanence. No wonder then many of us long to become permanent nomads, snails with houses on our backs, Touareg tribesmen, and Gypsies. Siegal, and others like her, are working toward reinventing the identity of the mobile house, changing the traditional design but retaining the concepts of affordability and flexibility. FTL Happold, an architecture, structural engineering, and interior design firm led by Buro Happold, designs structures such as a transportable music pavilion, which is carried by six custom semi-trailers to any open performance site. As with the Quonset, the size of the building has, in part, been determined by the means of transportation required to move it; in fact, "the allowable weight of the trailers for highway travel ultimately determined the exact surface area of the overhead tensile shell. "2 The German firm Festo Corporate Design works in the realm of "airtecture," including what it calls the "first building in the world to be constructed with a cubic interior comprised of supporting structures built with air inflated chambers"3-it can be folded up in a standard forty-foot container. Austrian architect Oskar Leo Kaufmann designed FRED, a customizable, building-block-style home that can be assembled in two hours on site. Japanese architect Shigeru Ban has become known for his experimentations with and highly successful applications of alternative materials. 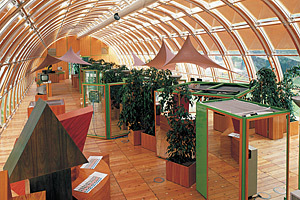 Instead of wood, he used paper in 1986 to build a small pavilion. Though applied as a result of a tight budget, he was pleasantly surprised at the effects of the substitute, specifically the strength of the paper, and, inspired by traditional Japanese houses made of bamboo, began to use paper tubes in his built structures. This eventually developed into an ingenious application in inexpensive and durable housing units, first offered to the victims of earthquakes in Kobe, Japan, in 1995, and later to house refugees in emergency situations in other parts of the world. Jeremy Edmiston and Douglas Gauthier of the New York firm SYSTEMarchitects set out on a similar mission, designing refugee housing for Kosovo and creating an easily transportable, simple-to-construct kit of parts to create housing from prefabricated components. Their project was designed to be constructed primarily of Stresskin, an inexpensive panel system that sandwiches a layer of foam between two sheets of corrugated-metal decking, providing insulation as well as durability. So why not the Quonset hut? Will it see a rebirth? Although the DNA of the Quonset-whose unique structural system liberated the interior space from walls and other supports-can be found in any number of contemporary designs, such as the Steven F. Udvar-Hazy Center at the Smithsonian's National Air and Space Museum, a revival seems unlikely. Perhaps the answer to the question of its unlikely restoration is partly in its geometry and partly in the American ideal that new is always better. The Quonset hut's shape is both its charm and its nemesis. The Quonset hut is a simple geometric form where the walls and roof are one and the same, much like the tipi, A-frame, igloo, and pyramid. None of these, all popular building forms in their time, have prevailed in contemporary times. Though cost- and time-efficient, the Quonset possessed attributes, such as portability and ease of assembly, that overshadowed its less-than-desirable use of space. Its curved walls create a lot of lateral space too low to stand in. As a dwelling, the Quonset hut was often unfriendly to furniture, artwork, and other traditional, domestic embellishments. Jim Griffin, who grew up in a Quonset home in Seward, Alaska, said its form made the Quonset hut a challenge to beautify: "When you're in a building that's got, I'm going to guess, twenty- to twenty-five-foot diameter with three-foot pony walls holding up that curve, you don't have a lot to work with. Especially if you're not real creative as an architect." The city auctioned off about fifteen They were using them for storage. In fact, mine was full of old parking meters. They had a silent-bid auction, so I went down there. I was just going to use it as a temporary building, a studio to work in...I think I got it for $120. I picked the very best one out of the fifteen of them-just picked the one that was in the best shape. And I won it. Nobody bid against me. So I took it apart with a screwdriver and took it home. I put it back together and then built a little arctic entry that kind of matches the curve. Instead of my studio, it became my house. Frank Gehry once said, "The only time we notice buildings is when they are being built and when they are falling down." Quonset huts are doing just that; they are falling down. Where they have not been dismantled and shipped out, they have been left to rust and decay. Today, the few Quonset huts that remain in use still serve as stores, restaurants, homes, and churches, but they are distinct icons of the past. Some are preserved because of the simplicity they represent; others are merely the most economic solution to a need for shelter. Our nation's relationship with the Quonset has been a tumultuous, complicated, and, at times, an affectionate one. Cathleen Doyle, a resident of Fairbanks, Alaska, who once lived in a Quonset hut said: "After you've lived in a Quonset, it's kind of a love hate relationship-you start hating it at the beginning, and then by the time you leave, you're looking at your new house and saying, 'Lets put an arch into the house-sort of like a Quonset, but not really.'" Perhaps the Quonset hut will enjoy a resurgence in a time of crisis and return to its glory days when it was prefabricated by the tens of thousands. More likely, some other structure, born from the specific needs of its era, will rise to the occasion. 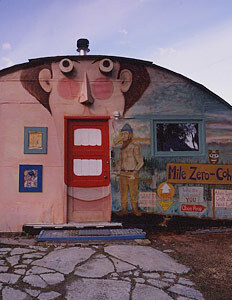 The Quonset hut was a building of its time that got to hang around just a bit longer. Perhaps it falls just short of being celebrated. But its simple form, its sometimes awkward but proven ability to adapt to a variety of climates and uses, its durability, and its stubborn longevity make it a true American icon. It's the temporary building that almost became permanent. It is the hut that has come full circle.